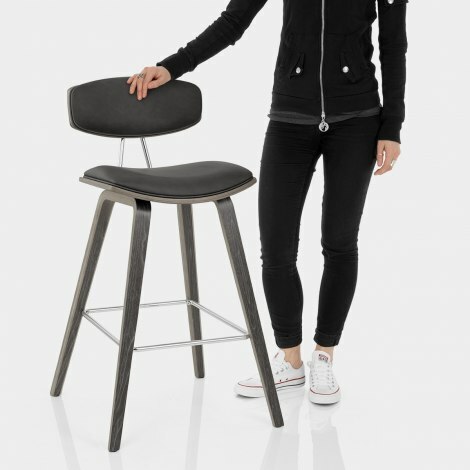 The Henley Wooden Stool Charcoal is a chic blend of contemporary design and classic materials. Innovative and interesting, the Henley Wooden Stool Charcoal will become a sight to behold in your kitchen or bar, with its completely unique appearance. Covering the seat and backrest pads is stylish charcoal faux leather, which gives charm and character. Both are supported by a bentwood shell, which boasts an antiqued grey finish with an emphasised wood grain. The four-legged frame below has a matching finish, and is fixed at the perfect height for kitchen worktops and islands. 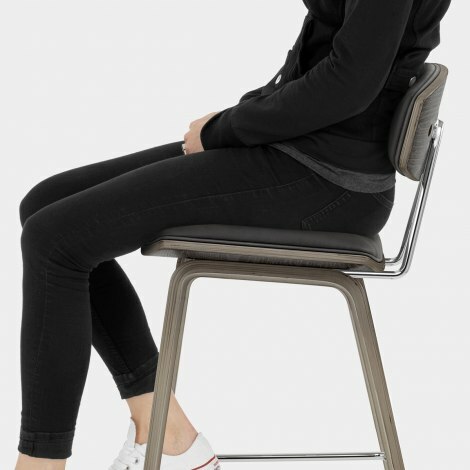 The solid wooden legs are connected by chrome bracing bars that act as a footrest and ensure your feet are adequately supported. Finally, the Henley has protective guards beneath the frame to help preserve your floors. "Good value & quality. Nice design"
These chairs were perfect for our kitchen island. They are are very sturdy and look exactly as advertised. High standard customer service - The legs of our chairs were damaged on arrival. Once we raised this with the company, they promptly replied (no questions or quibbles) and had replacement legs sent to us the next day! Many thanks for placing your order with us and leaving a review with photos. Its always great to see the stools in situ. We are sorry about the slight hiccup - but glad it all got resolved for you now.